ENSO is in a cold phase (La Niña) and it is wetter and warmer than normal. Strong precipitation in October greatly improved Puget Sound streamflows. At the coast, we had strong downwelling. As a result, water temperatures, salinities, and oxygen in Puget Sound are returning to normal. While surface water in Puget Sound has cooled, it is still warmer than in the Straits. Surprisingly, masses of suspended sediment occurred east of Steamboat Island in Totten Inlet. We continue to see large jellyfish aggregations in finger Inlets of South Sound and slowly fading red-brown blooms. Description ENSO is in a cold phase (La Niña) and it is wetter and warmer than normal. 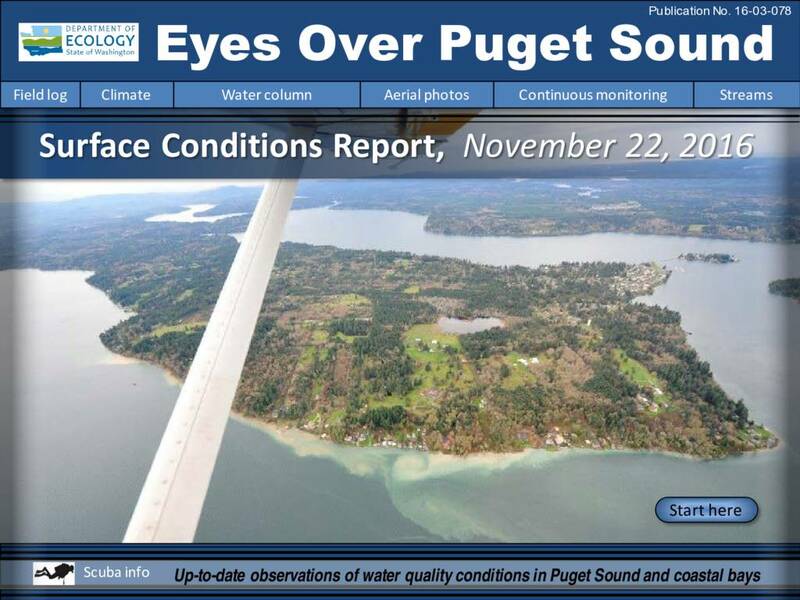 Strong precipitation in October greatly improved Puget Sound streamflows. At the coast, we had strong downwelling. As a result, water temperatures, salinities, and oxygen in Puget Sound are returning to normal. While surface water in Puget Sound has cooled, it is still warmer than in the Straits. Surprisingly, masses of suspended sediment occurred east of Steamboat Island in Totten Inlet. We continue to see large jellyfish aggregations in finger Inlets of South Sound and slowly fading red-brown blooms.